Earlier this year, the railways had opened the 190 km Ateli (Haryana) to Phulera (Rajasthan) section of the Western DFC. The 143 km section between Bhadan and Bhaupur on the Eastern DFC, will be completed by January 2019 and the 128 km section between Madar and Marwar on the Western DFC, would be commissioned by February 2019. The Bhaupur-Mughalsarai section of the Eastern DFC will be completed by August 2019 and the Sone Nagar (Bihar) – Mughalsarai (UP) section of the same stretch will be completed by October 2019. The railways is optimistic that the entire DFC will be fully electrified by the time of its starting in March 2020. Passing through 9 states and 60 districts, the project will have 48 stations and junctions along the Western DFC and 58 stations and junctions on the Eastern DFC. For the first time in Railways is using most advanced NTC machines which can lay around 2.5 km rail tracks in a day. The Western Corridors is being funded by Japan International Cooperation Agency (JICA), while the Eastern Corridor from Mughalsarai to Ludhiana is being funded by the World Bank. While the eastern DFC will connect Mughalsarai with Ludhiana, the western DFC will run between Dadri and Jawaharlal Nehru Port. 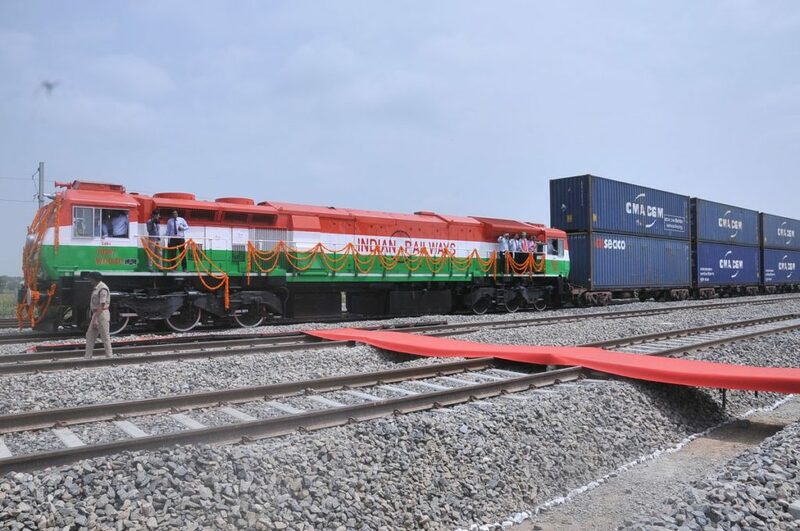 A new freight corridor between Kharagpur in West Bengal and Vijayawada in Andhra Pradesh named East Coast Freight Corridor, besides the ongoing projects of the Eastern and Western freight corridors has also been announced last month. Freight trains on DFCCIL will be capable for attaining speeds of 100 kmph as against the current maximum speed of 75 km/h on Indian Railway. The average speed of freight trains will also be increased from existing speed of 26 kmph on lines to 70 kmph on Dedicated Freight Corridors (DFC). DFCCIL has been set up with 100% equity by Ministry of Railways and registered as a company under the Companies Act 1956 on 30th October, 2006. The genesis of the Dedicated Freight Corridor is due to saturation in rail transportation capacity of Indian Railways on the Golden Quadrilateral. The Indian Railways’ network linking the four metropolitan cities of Delhi, Mumbai, Chennai and Howrah, along with its two diagonals (Delhi-Chennai and Mumbai-Howrah) commonly known as the Golden Quadrilateral, adding up to a total route length of 10,122 km, carries more than 58% of its revenue earning freight traffic. The Indian Railways is the lifeline of the nation. Growth in Indian Economy is leading to surge in power demands requiring heavy coal movement, booming industrial growth & infrastructure construction. Growing international trade along existing Eastern and Western Routes has led to the demand for additional capacity for rail freight transportation. 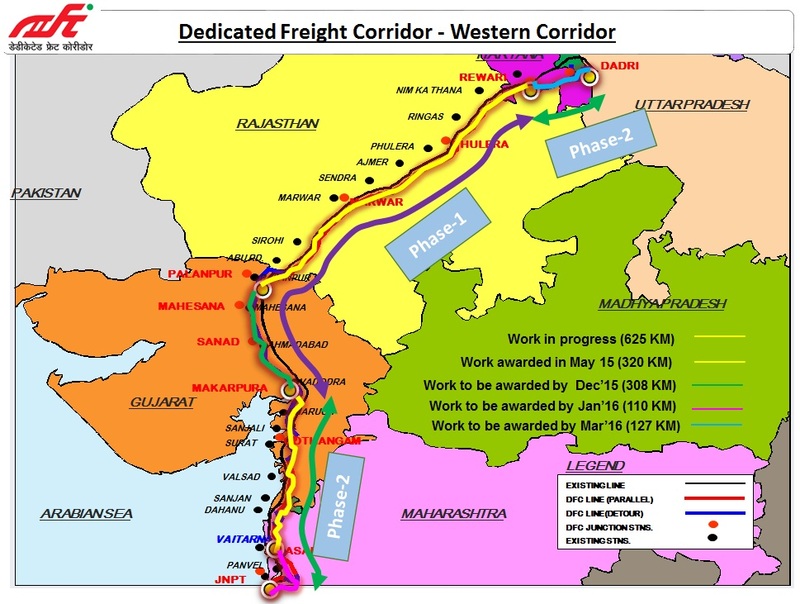 In the first phase, the Government of India has approved construction of two corridors-the Western DFC (1504 route km) and Eastern DFC (1856 route km)- spanning a total length of 3360 route km. The Eastern Dedicated Freight Corridor with a route length of 1856 km consists of two distinct segments: an electrified double-track segment of 1409 km between Dankuni in West Bengal & Khurja in Uttar Pradesh & an electrified single-track segment of 447 km between Ludhiana (Dhandari Kalan) – Khurja – Dadri in the state of Punjab, Haryana and Uttar Pradesh. Due to non – availability of space along the existing corridor particularly near important city centers and industrial townships, the alignment of the corridor takes a detour to bypass densely populated towns such as Mughalsarai, Allahabad, Kanpur, Etawah, Ferozabad, Tundla, Barhan, Hathras, Aligarh, Hapur, Meerut, Saharanpur, Ambala, Rajpura, Sirhind, Doraha and Sanehwal. Since the origin and destinations of traffic do not necessarily fall on the DFC, a number of junction arrangements have been planned to transfer traffic from the existing Indian Railway Corridor to the DFC and vice versa. These include Dankuni, Andal, Gomoh, Sonnagar, Ganjkhwaja, Mughalsarai, Jeonathpur, Naini/Cheoki, Prempur, Bhaupur, Tundla, Daudkhan, Khurja, Kalanaur, Rajpura, Sirhind and Dhandari Kalan. The Eastern Corridor will traverse through 6 states. 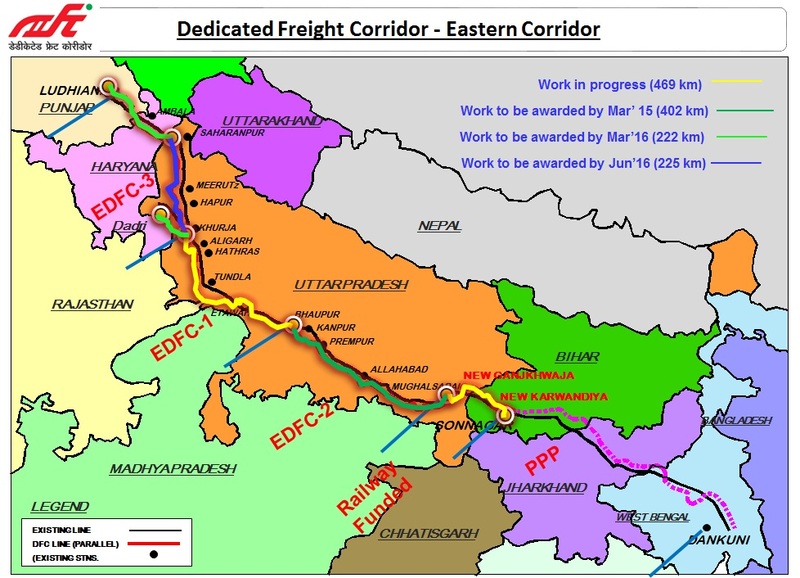 Eastern Corridor is projected to cater to a number of traffic streams-coal for the power plants in the northern region of U.P., Delhi, Haryana, Punjab and parts of Rajasthan from the Eastern coal fields, finished steel, food grains, cement, fertilizers, limestone from Rajasthan to steel plants in the east and general goods. The total traffic in UP direction is projected to go up to 116 million tonnes in 2021-22. Similarly, in the Down direction, the traffic level has been projected to increase to 28 million tons in 2021-22. As a result, the incremental traffic since 2005-2006, works out to a whopping 92 million tons. A significant part of this increase would get diverted to the Dedicated Freight Corridor. The following table depicts the distance traversed through each state. However, it is entirely on a new alignment from Rewari to Dadri. The Western DFC is proposed to join Eastern Corridor at Dadri. Junction Stations between the existing railway system and the Western DFC have been provided at Vasai Road, Kosad/Gothangam, Makarpura (Vadodara), Amli Road (Sabarmati), Palanpur, Marwar Jn., Phulera, Rewari and Pirthala Road. Lean organization with higher efficiency. Higher throughput per wagon and per train. Provision for Time Tabled Schedule Trains. 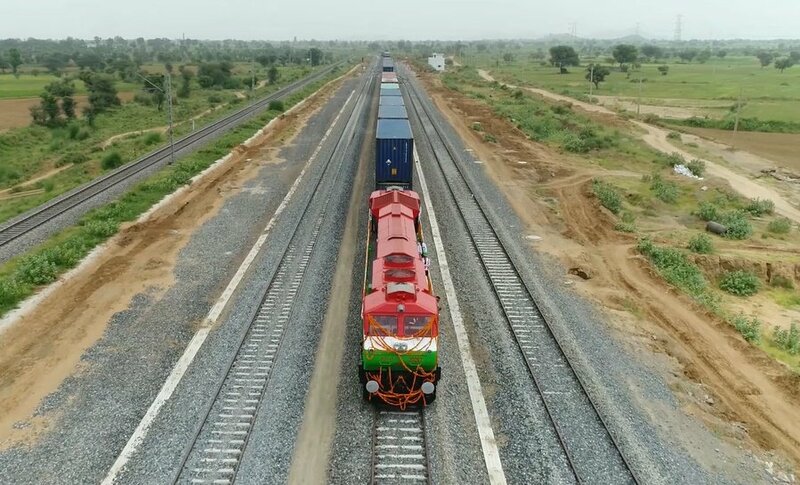 Western Corridor comprising of 1504 km of a double line track from Jawahar Lal Nehru Port Trust to Dadri via Vadodara-Sanand-PalanpurPhulera-Rewari. Alignment has been generally kept parallel to existing lines except provision of detours and entirely on a new alignment from Rewari to Dadri and also from Sanand to Vadodara. Western DFC will join Eastern Corridor at Dadri. The connectivity of WDFC with Indian Railways has been planned at Dadri, Prithala, Rewari, Ateli, Phulera, Bangurgram, Marwar, Palanpur, Chadotar, Mehsana, Sanand(N), Sanand(S), Makarpura, Udhna, Kharbao and JNPT. The Corridor will provide a boost to EXIM Trade. Traffic comprises of mainly EXIM containers, between Jawahar Lal Nehru Port Trust and Mumbai port and port of Pipavav, Mundra and Kandla and ICDs located in northern India. Besides this POL, imported Fertilizers, imported coal, Food grains, Cement, Salt, and Iron & Steel will have major contributions for traffic moving on the Corridor. Expected traffic over WDFC, year 2021-22: 152.24 (million tonnes). An electrified double line segment of 961 km between Khurja-Dadri-Mughalsari-Sonenagar. An electrified double line segment of 549 km between Sonnagar to Dankuni. The junctions with Indian Railways on the Eastern Corridor have been planned at Chawapail, Sirhind, Sambhu, Kalanaur, Pilkhani, Dadri(U), Khurja, Daudkhan, Tundla, Bhaupur, Bhimsen, Kanpur, Karchchna, Ahraura Road, Mughalsarai, Ganjkhwaja, Sonnagar, Gomoh, Andal(W), Andal, Andal(E) and Dankuni. Temporary junctions are planned at Karwandiya, Sasaram and Durgawati. This corridor will have 58 crossing stations. Traffic on EDFC comprises of coal for the power plants in the northern region of India from Coalfields located in state of Bihar, Jharkhand and Bengal, finished steel, food grains, cement, fertilizer, limestone from Rajasthan to steel plants in the east and general goods. East-West Corridor (Kolkata-Mumbai) Approx. 2327 Kms. North-South Corridor (Delhi-Chennai) Approx. 2328 Kms. East Coast Corridor (Kharagpur-Vijayawada) Approx. 1114 Kms.